Hmmm. What can I say? A 320 page book intended for children grades 3 through 7. That’s what Amazon says, but I say, no way. 9-year-olds will love this book, yes. And yes, it is a book about a gorilla and his friends, both animal and human. However, this story goes much deeper. So much that I’m recommending this to anyone asking. 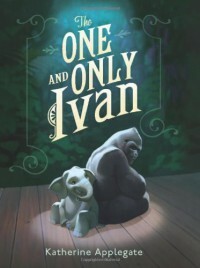 Children’s book or not, the story of Ivan the gorilla gave me goosebumps and tears, both sad and happy. There were moments in this book that reminded me of the same moments I shared between Mitch and his mentor, Morrie (not that you should expect the same type of story). And as such, I will be repeat reading this story on more than one occasion. And what greater compliment can you give a book than to say it has moved you, that it resonated with you, and that you will pick it up again?